O’Donnellan & Joyce recorded virtually 100 per cent sales of Galway properties in its Wild Atlantic Way spring property auction, when 42 properties went under the auction hammer on Friday March 1. Colm O’Donnellan of O’Donnellan & Joyce, who conducted the auction of the 42 properties, said it was “without a doubt, the best spring auction we’ve had in years”. The auction room in the Harbour Hotel was packed to capacity for the event, with people spilling out into the foyer. There was intense bidding throughout the afternoon with enormous interest, not only from local buyers, but also international buyers. One of the properties that went under the auction hammer in Lettercallow, Connemara, had 20 different bidders in the room, along with staff of O’Donnellan & Joyce on the phones, aligned with bidding online. This particular auction was advertised intensely and it paid enormous dividends with the great interest that was shown on the day. First to go under the hammer on Friday was this four bed detached house at Grangemore. Properties here rarely come to the market for sale and this house had two bidders chasing it. Guiding €380,000, the bidding opened at €360,000 and after an intense burst of over and back bids, the hammer dropped to a very happy buyer who bought it for €410,000. Another gem in the O’Donnellan & Joyce catalogue, this three bed family home has been extended upwards and outwards to provide plenty of living space for a growing family. Ideally located close to NUIG and UHG, Galway city centre is just a short walk away. The AMV was €225,000 and bidding opened at that with a proxy bidder. After 21 bids from a phone bidder, a proxy bidder, and bidders in the room, the hammer dropped at €262,000 to a phone bidder in America. Superbly located three bed detached residence within the Renville Village complex with an AMV of €230,000. Situated next to the popular Galway Bay Golf Club & Country Club, this residence has lots of amenities close by such as Renville Park and the Galway Bay Sailing Club. The bidding opened at €200,000 and 15 bids later it sold for €270,000. This three bed duplex apartment was guiding €46,000. Located within 10 minutes of Tuam town with convenient access to the M7 with connections to Galway/Limerick/Dublin, bidding opened at €46,000 and with a number of phone bidders frantically chasing it, it finally sold after 13 bids at €61,000. There was great excitement in the room when the hammer dropped on this property. This four bed semidetached house in Tuam had a phone bidder in Australia and a number of bidders in the room. Bidding opened at €110,000 and finished at €156,000 to the very happy purchaser. A perfectly located detached house close to Galway city centre, just a short walk from UHG and NUIG. This house needs full refurbishment to bring it back to its former glory — but what a location! The AMV was €220,000 and it sold for €310,000 after 12 bids from a phone bidder and bidders in the room. This three bed mid-terrace starter home was guiding €95,000 and had plenty of interest. Bidding opened at €90,000 and it sold for €122,000, after 17 different bids, to a phone bidder in Australia. This city centre three bedroom duplex apartment with spectacular, uninterrupted, views over Galway Harbour came to the market with an AMV of €280,000. Bidding opened at €270,000 and it was withdrawn at €290,000. It sold afterwards outside the room to a property investor. Semidetached five bed family residence located beside O’Higgins Hardware Store and close to UHG and NUIG. This property sold after auction to an investor for €287,500. A mixed used development consisting of four ground floor commercial units, a warehouse, and 13 apartments, being sold as one lot. The property was withdrawn from the auction at €360,000 and sold afterwards for €400,000. Arranged over three storeys, this four bed townhouse with large walk-in attic and a private rear garden was guiding €150,000, and after two bidders pursued it, the hammer dropped at €174,000. First floor office space of approximately 2,500sq ft, comprising nine individual offices, boardroom, reception, canteen, and toilets. 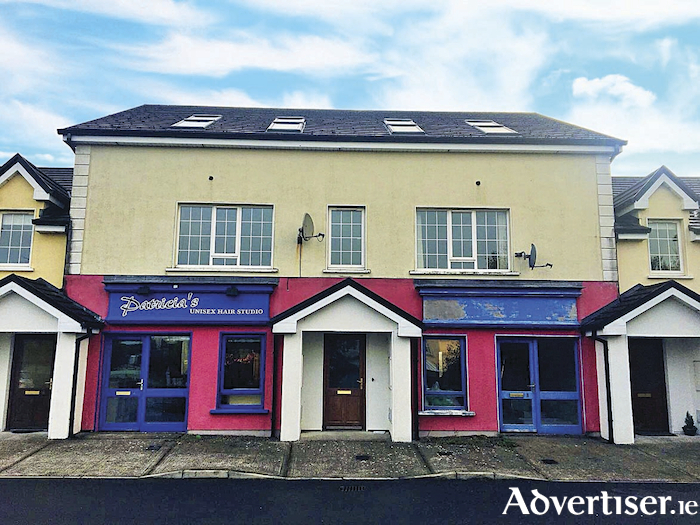 Situated to the front of the Oldenway Business Park and facing directly onto the Old Monivea Road, this property sold after a number of bids for €90,000. Superbly located two bed, first floor, corner apartment, just a few minutes’ walk from Galway city centre. No 84 comes with a private underground parking space, and the NRG Health & Fitness Centre is located on site. It sold after the auction to an investor for €207,500. An exceptional home in the centre of Loughrea. Originally constructed in the early 1800s, this property has been refurbished extensively and presented in turnkey condition. The AMV was €220,000 and the property sold for €245,000 after some intense bidding. This two bed first floor apartment adjacent to Joyce’s Supermarket was sold with tenants in place for €120,000. Semidetached four bed residence close to Athenry town centre sold with tenants in place for €150,000. This three bedroom mid-terrace residence was being sold with tenants in place. Presented in excellent condition throughout with an AMV of €165,000, after 11 bids this property sold for €181,000. This two bedroom first floor apartment conveniently located to Galway city centre came to the market with tenants in place and an AMV of €125,000. It sold for the asking price. The final lot for sale on Friday March 1 was this two/three bedroom stone cottage with several stone outbuildings, located two miles from Lettermore and situated on a large parcel of land of approximately 10 acres extending out to the sea. The asking price was €40,000 and after 17 intense bids among five phone bidders, one online bidder, and a number of bidders in the room, the hammer finally fell at €103,000. Two bed mid-terrace residence, easily accessible from Sligo town, sold for €47,000. Detached four bed bungalow on a site of circa 0.69 acre was sold with tenants in place. The hammer dropped at €156,000. Two storey partially completed residence on circa 23 acres of land sold for €96,000. Corrabaun, Elphin, Co Roscommon Detached two bed residence with a number of outbuildings on a large site of circa 9.7 acres sold for €90,000. Semidetached three bed residence sold with vacant possession for €90,000. Detached four bed residence requiring some upgrading and overlooking Lough Mask, sold for €80,000. Ground floor commercial unit currently leased to O'Brien’s Sandwich Bar, on a high profile corner site just off O'Connell Street, sold for €240,000. Bright and spacious modern four bed mid-terrace house, in a very well maintained development on the Boyle Road in Frenchpark, sold after auction for €69,000. Eleven units comprising a mix of different house types, located off the Shanaway Road just 2km from Ennis town centre, was sold with tenants in place for €870,000. O’Donnellan & Joyce’s next property auction will take place on Thursday April 18 (Holy Thursday ) at the Harbour Hotel, New Dock Road, Galway. For further information contact O’Donnellan & Joyce auctioneers, 5 Mary Street, Galway, on 091 564 212, www.odonnjoyce.com or email [email protected] .